This year has seen AMD update its entire CPU product stack with launch after launch, targeting everyone from entry-level users with the Ryzen 3 series to hard-core enthusiasts with Ryzen Threadripper, and data centre customers with Epyc. Now, the company is fulfilling its promise to launch laptop APUs, or Accelerated Processing Units with integrated graphics, before the end of 2017. AMD is calling its latest launch the “world’s fastest processor for ultrathin notebooks”, which is a tall claim, as these processors will have to go up against Intel’s brand new 8th Generation Core lineup. 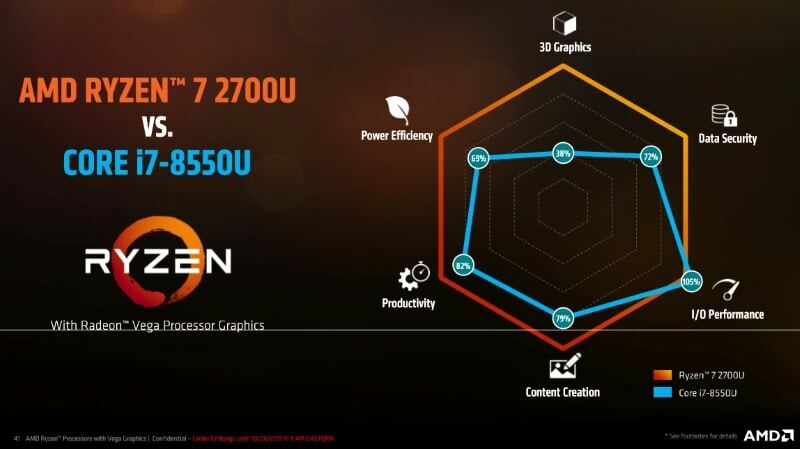 Previously codenamed ‘Raven Ridge’, Ryzen Mobile APUs combine the highly praised Zen CPU architecture with the recently launched Vega GPU architecture. There are only two models, the Ryzen 7 2700U and the Ryzen 5 2500U. AMD claims an astonishing 161 percent graphics performance lead over its competition and 44 percent more CPU performance in multi-threaded tasks. Compared to AMD’s previous “Bristol Ridge” mobile APU offerings, the company is claiming up to 3X CPU performance, 2.3X graphics performance, and 58 percent less power consumption. AMD also says that apps launch up to 41 percent faster. While Intel’s 8th Gen Core i7-8550U might have a slight edge over the Ryzen 7 2700U in Cinebench R15’s single-threaded test with scores of 159 and 144 respectively, the multi-threaded test gives AMD a significant advantage, with a huge lead of 719 points compared to 498. AMD also shows performance leads over Intel in POVRay, PCMark 10 and TrueCrypt, but not in PassMark. When it comes to graphics performance, AMD claims that its Ryzen 7 2700U APU alone outperforms an Intel Core i7-7500U with an Nvidia GeForce 950M GPU by 915 points to 900 in 3DMark Time Spy. AMD also claims playable framerates in an ultrathin notebook form factor. Users can expect to run League of Legends, DOTA 2 and CS:GO at 1920×1080, and Overwatch and Quake Champions at 1280×720, and still get between 43fps and 66fps depending on the quality settings used. Moreover, 4K streaming is supported by Amazon, Vudu and Netflix. HDR and Freesync 2 are supported on both internal and external displays. The Ryzen 7 2700U and Ryzen 5 2500U are both quad-core processors featuring simultaneous multi-threading, allowing each core to run two threads at the same time. The Ryzen 7 model has a maximum clock speed of 3.8GHz, and 10 GPU compute units running at 1300MHz. The Ryzen 5 model has a maximum clock speed of 3.6GHz and 8 GPU compute units running at 1100MHz. 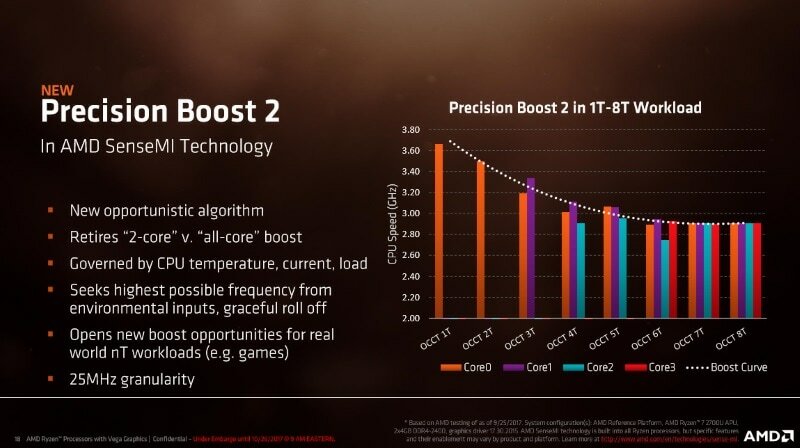 Notably, AMD is not publicising base clock speeds, which are 2.2GHz and 2.0GHz respectively. Mobile Ryzen processors will feature a single Core Complex of four cores, rather than the two used on all desktop parts (regardless of actual core count). Both processors have 6MB last-level caches and are configured to run within a 15W TDP envelope, though notebook manufacturers can reconfigure this down to 12W or up to 25W to suit their designs. Dual-channel DDR4-2400 RAM is supported. AMD has worked on optimising power delivery to the CPU and GPU logic on the chip, and can trade off power between CPU cores as well as GPU compute units opportunistically, depending on load and operating conditions. The 2xxx naming scheme indicates a generation leap compared to the desktop Ryzen 3, 5, 7, and Threadripper models, which are all numbered 1xxx, though AMD isn’t promoting its new APUs in such a way. While the company has not announced any major changes to the underlying design of these CPUs, the Ryzen Mobile family leverages what AMD calls Precision Boost 2, which is an update to the original Precision Boost feature in previous Ryzen models. It allows CPU cores to adjust their speeds dynamically in small increments depending on the current workload as well as speed and power conditions. And with this new version, AMD says the rolloff from a higher to lower speed is more graceful. AMD is also introducing what it calls mXFR, or Mobile Extended Frequency Range, which allows notebooks with speficially optimised cooling solutions to run at even higher speeds for longer durations. Such models will be marketed as “Ultimate XFR Performance” certified. The Zen CPU cores and Vega GPU compute units are all designed around AMD’s Infinity Fabric, the interconnect technology that was announced as one of AMD’s Zen architecture features, and is used across AMD’s 2017 product stack. It unifies data and control connections between the CPU cores, GPU, IO hub, DDR4 RAM controllers, and other onboard logic. It also enables AMD’s SenseMI feature, using thousands of embedded sensors to monitor CPU speed, power consumption, voltage, and temperature in real-time. Acer has announced the Swift 3, which weighs 1.8kg and is 18mm thick, with a 15-inch full-HD screen, up to a 256GB SSD and 8GB of RAM. HP is announcing an Envy X360 variant weighing 2.15kg and measuring 19.5mm thick, featuring a 15.6-inch full-HD touchscreen, USB Type-C with power delivery, up to a 512GB SSD or 1TB HDD. Lenovo has announced its Ideapad 720S with a 13.3-inch full-HD screen, USB Type-C with power delivery, up to a 512GB SSD, coming in at 13.6mm thick and weighing 1.14kg. These models are slated to be available “in the coming weeks”, though that refers to the US market. Dell, Asus and other companies have announced that they are on board, but will launch their models in early 2018. AMD has teased that it will have more to show at the CES 2018 industry event in January next year.